What are the various layers of Earth’s atmosphere? The bottom layer of Earth’s atmosphere is called the troposphere. This level is the air we breathe; it contains clouds and weather patterns. Above the troposphere is the stratosphere, which starts at an altitude of about nine miles (fourteen kilometers). The temperature in the stratosphere is a frosty –58 degrees Fahrenheit (–50 degrees Celsius). From an altitude of fifty miles (eighty kilometers) up to about 200 miles (320 kilometers), temperatures increase dramatically, even though the atmospheric density is very low; this is the thermosphere. 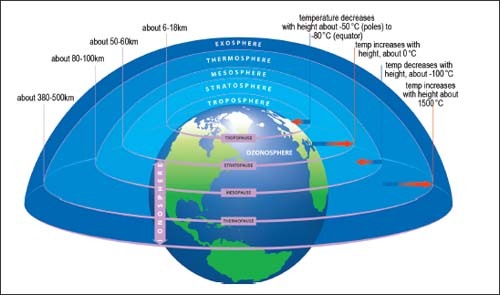 Above the thermosphere is the highest layer of Earth’s atmosphere: the exosphere or ionosphere. At this level, gas molecules break down into atoms, and many of the atoms become electrically charged, or ionized. Scientists divide and categorize Earth’s atmosphere into several distinct layers. The thickness of the atmosphere is greatly exaggerated in this diagram.